Over the past few months, we have witnessed the greatest opposition to the freedom of Americans to speak their minds that I can remember. Vocal and violent protests to conservative speakers on college campuses only demonstrates the fear that the Progressive Left has for the rational and confrontational opposition to their point of view. The fact that college and university campuses have “safe spaces” for their sensitive snowflake social justice warriors is a far cry from the purpose of higher level education to turn out well rounded, well-educated graduates. Indeed, they are turning out mental and emotional cripples incapable of listening to and evaluating different points of view. This trend of graduating emotionally mental midgets can be blamed directly upon the staff and administration of these colleges and universities, and indirectly, are violating the First Amendment of the Constitution. Here’s the problem with political correctness – the standard of what is politically correct is subject to what someone finds objectionable to their race, religion, and/or belief system. In other words, there are no absolute standards or limits to what these people would find objectionable. Where this could eventually lead is a suppression of our ability to voice our opinions for fear of being publically attacked, and potentially charged with a hate crime. 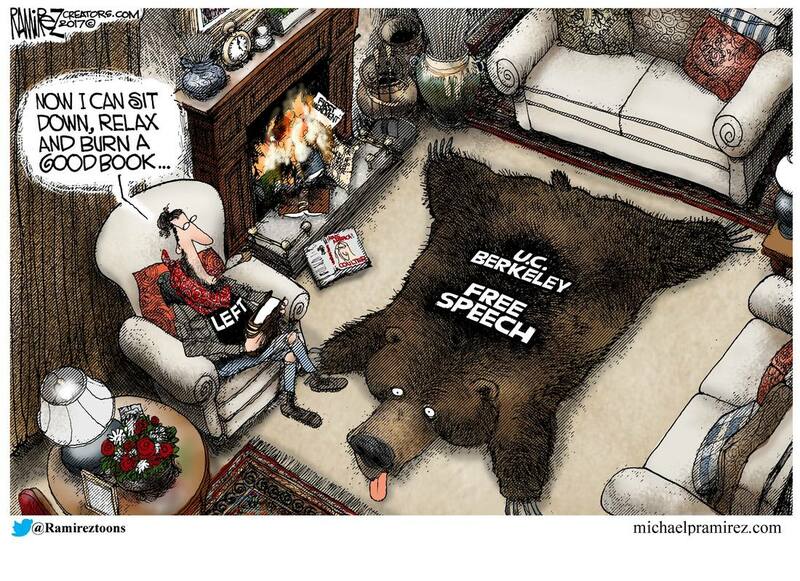 Freedom of speech now becomes a casualty of “political correctness” and “hate crime” laws. The First Amendment does not define what is or is not hate speech, nor should Congress define it as well with the laws it passes. However, Congress has passed laws defining certain crimes singled out as being “hate crimes” when in fact all crime is hateful against society – the circumstances behind that crime may be heinous, but should be dealt with within the criminal code without regard to whether the victim or criminal is black, white, straight, gay, etc. That by itself is discriminatory. Everyone that is of Asian, African, European, etc. descent. Everyone who hates eating liver, asparagus, cauliflower, etc. A bit ridiculous, right? And that is exactly the point!! Limiting the ideas and opinions that people can express demeans us all, and limits our individual ability to grow as a person. Yes, we do reserve the right to agree or disagree with the opinions expressed (and even to walk out & not listen to the speaker), but we do not have the right to prevent them from speaking or assault the person for expressing themselves. Yet, this is exactly what happened to conservative speakers that were engaged to speak at college campuses in California. The excuses given have been that the speakers “trigger” violent activities, promotes hate speech, is a racist, and a host of other charges. But when it really gets down to it, it is not the speakers that are the problem, but the protestors. By inhibiting the free speech that the protestors supposedly support, the protestors have revealed themselves not only as being hypocrites, but as being more intolerant than they have accused the speakers to be. 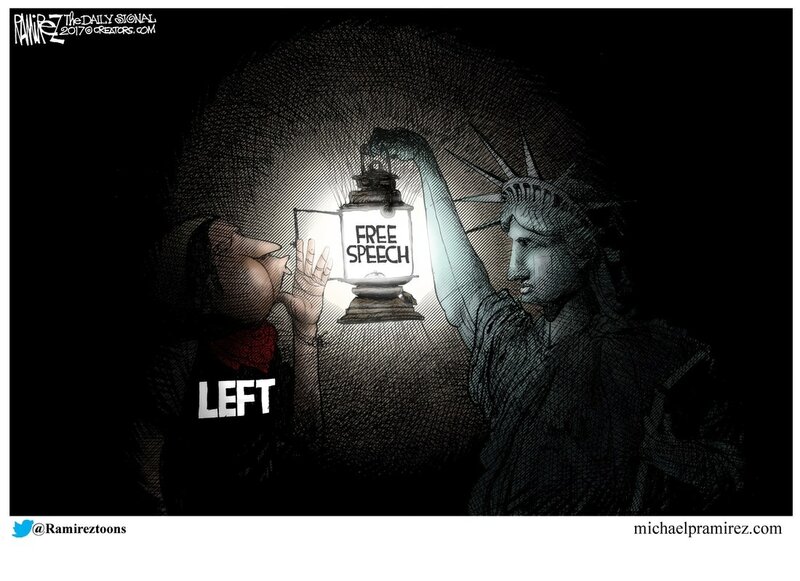 We have the First Amendment for a reason – for the freedom of expression, whether by our acts of Faith or speech, to disseminate those thoughts by talk or print, and to openly assemble to give a speech to voice those opinions, whether they are critical of the government or not. For thugs to protest this right of others to speak while keeping it only for themselves shows that they, not the speakers, are the real Fascists. This entry was posted in Political, Where is all this stupidity coming from? and tagged Freedom of Speech, Freedom of Thought. Bookmark the permalink. I have been so busy that I have all but neglected my blog. I need to come here more often. This is a great post Tom. Thanks for posting it. Thanks, Robert. Life, work, and family are keeping me busy as well – which is one of the reasons I haven’t been posting very much. Besides, the Liberals are predictably following their playbook – deceive, obfuscate, and lie to make America and the President look bad. Tom Roland, what are your views about the so-called Fairness Doctrine? Fairness Doctrine – Like anything proposed by politicians for the supposed equality for everyone, it is nothing of the sort. My main objection is that the government (aka politicians) will use this as a back door to regulate free speech by determining what is a valid opposing view. If it isn’t determined to be valid, then it will not be heard. This strikes at the heart of the First Amendment. Tom Roland, you are preaching to the choir.